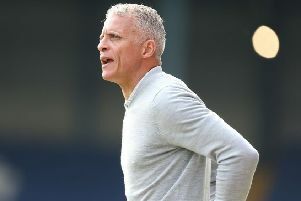 Keith Curle admits he is likely to be kept guessing until the last minute as to what what formation Newport County will field against his Cobblers team in Tuesday night’s Sky Bet League Two showdown at Rodney Parade (ko 7.45pm). Michael Flynn’s men go into the game off the back of a shock 2-1 defeat at lowly Cheltenham Town on Saturday, a result that saw the south Wales outfit slip from third to fifth in the league two table. The County boss admitted that he got his line-up and formation wrong for the game at Whaddon Road, and Curle says the 38-year-old is no stranger to shaking things up from match to match. “Newport are a very competitive team who fluctuate between different formations,” said the Cobblers boss. “The manager said after their game on Saturday that he wasn’t happy with his initial team selection and he was happier with how they finished the game. “They are a team who have played a number of formations, and I think they have had a few injuries and suspensions. The Cobblers are on a five-match unbeaten run in the league, while Newport haven’t lost on home soil in theit past seven games in all competitions. Indeed, they have lost just once on home soil this term, and that was in some style as they were thrashed 6-0 by Yeovil Town back on September 15. The Cobblers travel to south Wales having drawn their past two league games 2-2, with the previous game to that seeing them lose 3-2 at Lincoln City in the FA Cup. Curle took over from Dean Austin at the beginning of October. He has been unable to add any new players to strengthen any department of the team, and when asked about the amount of goals being conceded, he said: “I like clean sheets, but I am still tinkering and still experimenting. “I am still testing and challenging the players to play different roles and have different responsibilities, and I’ll do that until I am happy with the group I have got. “You have to remember I am still dealing with somebody else’s players, somebody else’s philosophy and somebody else’s wavelength of how they collected the players. “I am still fathoming out in my mind exactly what is in that changing room, and I am still setting challenges for players to give me answers. The Cobblers are without the injured Matt Crooks and Dean Bowditch, while Junior Morias is suspended.